We apply an individual approach to every pair of shoes, especially paying attention to what materials we use. It is important for feet to sweat as little as possible, so we strive to use natural materials. It is also important to use a proper last. We purchase lasts abroad and adjust them according to customers’ needs. In 2013 we started making men’s shoes. We carried out several tests wearing them and came to a conclusion, that sweating had reduced. Our goal is to make footwear of high quality that guaranties your feet comfort and health. We have been offering shoe repair services since 1989. One of the shoe repair shops is still located at Kr.Barona Street 10 – at the place where our shoe repair services first began. Over 20 years of experience and the most skilled craftsmen enable us to offer shoe repair work of any type and complexity. The company "Elegants" has been making custom made shoes since 1968. 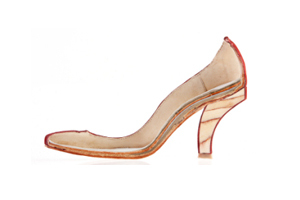 The shoes are made according to the client’s foot size which makes wearing them very comfortable. We create shoes according to the patterns available for viewing or the customer’s own sample. You can create your own shoe model based on a catalogue or even a photograph and we will make your most adventurous ideas come true. Return or exchange of goods. If you have purchased our footwear not in person, ordering it on our website, you can unilaterally withdraw from the contract within 14 days, without stating the reasons. the goods must not have marks of usage, they have to be in the original package with labels and markings. If the returned goods meet the above mentioned requirements, the amount of money spent on the footwear will be transfered to your bank account within 14 days. If you would like to exchange the footwear purchased on the internet shop for a different colour or size model it can also be done within 14 days by contacting us by phone or e-mail. In case the footwear is found to have shortcomings and it is not in Conformity with the Provisions of a Contract, according to the Consumer Rights Protection Law and Cabinet of Ministers Regulation No 631, within two years you have rights to turn to us with a claim and request a refund, defect prevention, price reduction or exchange of the goods. Footwear has to be chosen according to foot sizes and feet peculiarities (if there are any). To be sure of the footwear compliance with your leg, it has to be put on and you must walk around the store. It is not enough to try on just one shoe. If you are not sure of the footwear compliance with your leg, try on another pair or model. When putting the shoes on and taking them off your feet take care to loosen buckles, laces, touch fasteners and other ones as not to expose the upper details to additional load. Moisture effect on leather upper is not desirable since it favours shoe deformation. 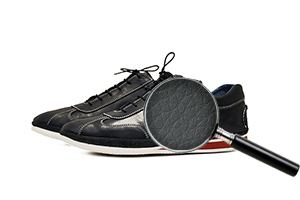 If a defect is found while wearing the shoes do not try to correct it yourself but show it to the seller. Natural abrasions, scratches, deformation of upper parts (according to the foot dimensions) is a natural deterioration process. Do not wear moist shoes, to dry the footwear put papers or special dryers inside it. The drying temperature must not be higher than +35 degrees. Do not wear one pair of shoes intensively, let it "rest", it will prolong its period of use. Timely restore the worn parts (healtaps, half soles, touch fasteners, etc.) when necessary. If the upper is decorated with a metal, plastic or other material, which is not tightly fastened to the upper, natural rubbing of the material, that is not a manufacturing defect, can emerge in the places where the upper and the decoration come into contact. clean the fixed dirt with a moist cloth – avoid intense rubbing of the upper leather. To realize the consumer rights one must comply with the obligations given in the usage instructions.